842000H Hearing Protection 21-23 Decibles Oversized foam ear cushions, no metal parts so it can be worn in electrical environments. Adjustable cups for proper fitting contour. Adjustable headband can be rotated and worn over or behind the head or under the chin. Noise reduction rating of 21-23 decibels when used as directed. 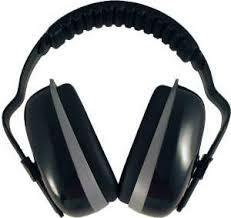 Protects hearing from excessive noise of power tools, chain saws, tractors, rifles and other loud noises.